I spent the day making both raspberry and strawberry preserve for saturdays market. The smell of strawberry preserve filling the house made me reach for a bowl to whip up a batch of scones to carry that gorgeous preserve. I decided today to make lemon to compliment the fresh strawberry preserve. The basic scone recipe ( without the lemon) is our family recipe which won us many an award in cookery competitions when we were kids. Fast and simple ,but delicious. Put dry ingredients in a bowl. Rub in the butter or margarine. Mix in lemon zest. Add 4/5 of the liquid and mix well, if the mixture is too dry add a bit more liquid or if wet add a bit of flour. Dont overhandle the dough or the scones will be tough . Either roll out or flatten the dough by hand (1inch or less) cut into shapes (we just cut it into squares as you can see) put on lightly floured baking tray .Brush with the remaining egg and milk mixture. Bake 8-10 mins at 200 degrees. spread with butter and jam yum! I must say we all really like the lemon flavour in these scones it went with the strawberry perfectly. 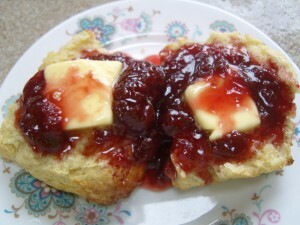 We didnt even wait for the strawberry preserve to set .We ate it hot out of the jar slathered on the hot fresh scones. To make cinnamon and orange scones add 1 tsp ground cinnamon to the above recipe ,substitute orange zest for lemon and add the juice of the orange to the mixture. We had these last week and they were so good.Nice and warming for the autumn. 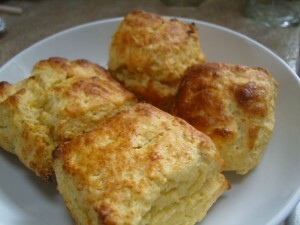 For savory scones use the above recipe without lemon or sugar . You can leave them as is or add herbs or grated cheese. These are especially excellent with soups. I was ably assisted in the making of these by Athene and Tess our current wwoofer. Love the idea of lemon zest in the scones. Great lemon zest in the scones. Great blog and wonderful recipe ideas. 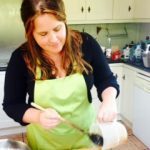 I teach on a few cooking Holidays around the world and I will definitely be recommending this blog to my students. 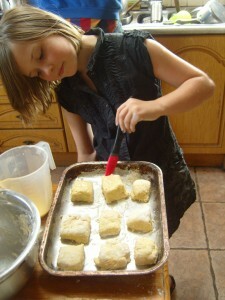 i remember winning many 1st prizes with this scone recipe!